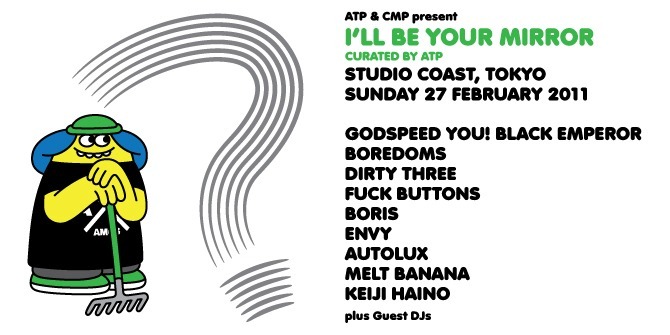 Legendary musical festival ATP has announced a show in Tokyo on Sunday, February 27th entitled “I’ll Be Your Mirror.” Lineup and poster after the jump. Tickets go on sale November 20th. This is one of their many off-shoot parties and festivals outside of England like the recent Jim Jarmusch-curated All Tomorrow’s Parties New York weekend-long extravaganza. The party is curated by ATP (rather than a single person or band) and should prove to be an epic event. This is the first ATP party in Tokyo since the festival’s inception in 2000.